Uber to launch fleet of self-driving Volvos. Will Pittsburgh residents hop in? Ride-sharing service Uber announced plans to start deploying self-driving cars in Pittsburgh later this month, marking the first time the evolving and pricey technology has reached the general public. As part of a $300 million deal with Volvo, Uber said it will produce a fleet of 100 self-driving XC90 vehicles for the test program by the end of the year, Bloomberg reported. Each of the vehicles in Uber’s fleet will be equipped with a driverless control system, including cameras, GPS tracking, sensors and lasers to help navigate the road. The service will also be free to anyone willing to give it a try. But, for now, a driver will also be present to course-correct the car, if needed. 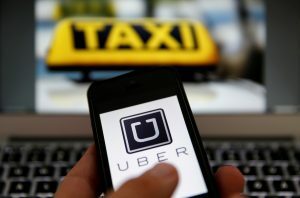 “Uber is doing the same thing many companies have been doing,” Bryant Walker Smith, an engineering professor at the University of South Carolina, told the NewsHour. But the big news is Uber inviting the general public into its self-driving cars, he said. Walker Smith said that consumers should expect to see more changes in transportation in the next couple of years. Smith said Uber’s decision is an opportunity for both the public and creators to discuss the pros and cons of autonomous driving. For one, Uber is trying to replace the jobs of those who drive for the company, he said. There could be a number of destruction to certain industries, like the taxi driver industry, and there “should be a public conversation about it,” he said. This is also a chance to inform the public about self-driving technology, he said. Although bonafide self-driving cars are still unavailable, Google and other Silicon Valley giants have tested semi-autonomous cars on the road for years. The Tesla Model S alone costs, on average, around $98,000, according to Edmunds.com. “We’ve got to be laser-focused on getting this to market because it’s not a side project for us. This is everything. This is all the marbles for Uber,” he told AP. Self-driving cars have the potential to increase mobility, but some safety concerns remain, Walker Smith said. In June, a Telsa driver’s death brought a lot of scrutiny. It was the first recorded fatal accident involving a self-driving car. What many forgot were the hundreds of people who died in car accidents caused by human drivers that day, Walker Smith said. “Nothing is perfect, and these things will fail sometimes, but they are part of making the public more informed,” he said. Uber’s deal with Volvo isn’t mutually exclusive either, Bloomberg reported, adding that Uber is allowed to work with other automakers. Also today, Uber announced that it had acquired Otto, a self-driving trucks startup, to aid its driverless car research. “Even if Uber was confident enough in the technology to dispense with a human, neither Pittsburgh nor any other city is ready to adapt its regulations to allow completely autonomous driving,” he said.